Lung cancer is one of the most frequently malignant cancers worldwide [1,2]. Non-small cell lung cancer (NSCLC) is a major type of lung cancer, accounting for nearly 85% of all lung cancer cases. Most patients are initially diagnosed at late stage and surgical resection has not been applicative for them, which means the mortality rate for NSCLC is relatively high . The prognosis of NSCLC patients is still poor and 5-year overall survival rate is only about 5% . Therefore, improvement in NSCLC treatments is urgently required. miRNAs are endogenous, noncoding RNAs with about 20-24 nucleotides . They bind to the 3’untranslated regions (3’UTR) of target genes, and regulate the translation and degradation of target mRNAs . Previous studies have identified miRNAs in a number of human cancers, including breast cancer , colorectal cancer , gastric cancer and NSCLC [9,10]. Among them, miR-202-3p was reported as a tumor suppressor miRNA [11,12]. Also, miRNAs may serve as biomarkers and therapeutic targets in NSCLC . Thus, miRNAs are potential to be efficient therapeutic targets for NSCLC treatment. Mucin 4 (MUC4) is a cell surface glycoprotein, widely expressed in multiple organs including lung, colon and prostate [14-16]. Canonical MUC4 is expressed as a single propeptide which is to experience following cleavage and dimerization . Increasing evidence showed this protein plays an important role in various cancers. Jeon et al reported that MUC1, 4 expression levels were significantly correlated with NSCLC histologic subtypes . In addition, study showed that MUC4 is highly specific tumor-associated mucin in biliary tract cancer . Database showed MUC4 is a potential target of miR-202-3p. However, there was no previous report that investigate the correlation between miR-202-3p and MUC4 in NSCLC. In the present study, the expression level of miR-202-3p in NSCLC tissues and cell lines were significantly downregulated. We revealed that miR-202-3p overexpression inhibits cell proliferation and induces cell apoptosis in NSCLC cells. Importantly, we further found that miR-202-3p directly targets and down-regulates MUC4 as well as its downstream signaling p-HER-2 and p-ERK in NSCLC A549 and H292 cells. NSCLC tissue samples and their adjacent normal tissue were collected from 30 clinical patients undergoing NSCLC resection. All these tissues were immediately snap-frozen in liquid nitrogen after surgery. This study was approved by the medical review board, and written informed consent was obtained from all the patients. The human NSCLC A549, H292 cell lines and normal human lung epithelial cell line BEAS-2B were purchased from the Type Culture Collection of the Chinese Academy of Sciences (Shanghai, China). The cell lines were cultured according to the manufacturer’s protocols, and maintained in Dulbecco modified Eagle medium (DMEM) supplemented with 10% fetal bovine serum (FBS), at 37°C in a 5% CO2 humidified incubator. The cells were seeded in six-well plates and transfected with miR-202-3p mimics or negative control using lipofectamine 2000 transfection reagent (Invitrogen, Carlsbad, CA, USA) following the manufacture’s protocol. The cells viability was detected following the introduction of the MTT assay. A549 and H292 cells were respectively plated in 95-well plates at 1 × 104 cells per well and incubated for 48 h after transfection. Different time after transfection (24, 48 and 72 h), cultivated medium was removed. Wash cells twice with PBS and then cells were incubated with 20 μl MTT (Sigma, USA) reagent at 37°C. After 4 h incubation, the supernatant was removed and isopropanol was added to dissolve formazan crystals. Optical density (OD) value of each sample was measured at a wavelength of 570 nm on a Microplate Reader. Two groups of A549 cells were plated in 6-well plates (500 cells/well) and cultured in DMEM medium for 3 weeks. Proliferating colonies were stained with crystal violet and colonies consisting of 40 cells or more were photographed for analysis. All procedures were performed in triplicate. Repeat above operations with H292 cells. 48 hours after transfection, A549 cells were trypsinized and washed with cold PBS. Resuspend the cells (1 × 106/well) in binding buffer. Annexin V-FITC and propidium iodide (PI) were added in each well under the direction of the Annexin V-FITC apoptosis Detection Kit (BD Pharmingen, San Diego, CA, USA). The apoptosis rate was then monitored by fluorescence activated cell sorter (FACS). The 3’-UTR sequence of MUC4 or the mutant (Mut) was cloned into the downstream of the firefly luciferase gene in the pmirGLO plasmid (Promega, Madison, WI, USA). MiR-202-3p mimics and mimic Con and the report plasmid pmirGLO-Gli1 Wt/Mut were co-transfected into A549 cells using Lipofectamine 2000 (Invitrogen, Carlsbad, CA, USA). 48h after transfection, luciferase activities were detected by Dual-Luciferase Reporter System (Promega, Madison, WI, USA) and Renilla-luciferase activities were measured for normalization. All experiments were performed three times. Total protein was isolated from cells using RIPA buffer. Protein concentrations were determined with a Pierce BCA Protein Assay Kit (Pierce Biotechnology, Rockford, IL), and 20 μg protein was loaded and separated on 15% SDS gels and transferred to polyvinylidene difluoride membrane (Millipore, Bedford, MA). Following transfer, membranes were blocked with 10% skimmed milk and incubated with the appropriate primary antibodies against MUC4(8G7), PY1248-HER-2(Santa Cruz Biotechnology, Santa Cruz), HER-2, p- ERK1/2,ERK1/2 (Sigma–Aldrich, USA),BCL-2, caspase-3 and GAPDH (Cell Signaling Technology Inc) at 4°C overnight. Detection was by peroxidase-conjugated secondary antibodies. Densitometry analysis was performed using the ImageJ software. Data are expressed as means ± standard deviation (SD) of at least three independent experiments. The data were analyzed by using the GraphPad Prism version 5.01 software. Differences were determined with the analysis of variance (ANOVA). For all comparisons, P<0.05 was considered to indicate a statistically significant difference. To explore whether miR-202-3p is dysregulated in NSCLC tissues, we collected 30 human NSCLC tissue samples and paired adjacent normal tissues to detect the expression of miR-202-3p by RT-qPCR. In Figure 1A, miR-202-3p expression was lower in human NSCLC tissues compared with the paired adjacent normal tissues. Furthermore, we examined miR-202-3p expression in normal human lung epithelial cell line BEAS-2B and NSCLC A549, H292 cells. As shown in Figure 1B, miR-202-3p expression was lower in the NSCLC cells than BEAS-2B. Next, results of RT-qPCR and western blot indicated that mRNA and expression of MUC4 in A549 and H292 cells was significant higher than that in BEAS-2B (Figures 1C, 1D). Our results provide novel evidence of miR-202-3p downregulation in human NSCLC tissues and cells, and MUC4 upregulation in NSCLC cells. Figure 1: Expression of miR-202-3p and MUC4 in human NSCLC. A) The expression levels of miR-202-3p in 30 pairs of human NSCLC Tumor and Normal tissues were detected using qRT-PCR. B) The expression levels of miR-202-3p in human NSCLC A549, H292 cells and normal human lung epithelial cell line BEAS-2B were detected by RT-qPCR. C) The expression levels of MUC4 in A549, H292 and BEAS-2B cells were detected by RT-qPCR. D) The protein expression levels of MUC4 in A549, H292 and BEAS-2B were detected by western blotting. To investigate whether miR-202-3p can affect the proliferation in NSCLC, we stably overexpressed miR-202-3p in A549 and H292 cells. As shown in Figure 2A, transfection of miR-202-3p mimics significantly increased the expression of miR-202-3p. MTT assays and colony formation assays were performed to evaluate the effect of miR-202-3p on cell proliferation. In Figure 2B, miR-202-3p overexpression could significantly inhibit the proliferation ability of A549 and H292 cells in MTT assays. Also, colony formation in the miR-202-3p group was much lower than that of control groups (Figure 2C). Thus, overexpression of miR-202-3p significantly suppresses proliferation of A549 and H292 cells. 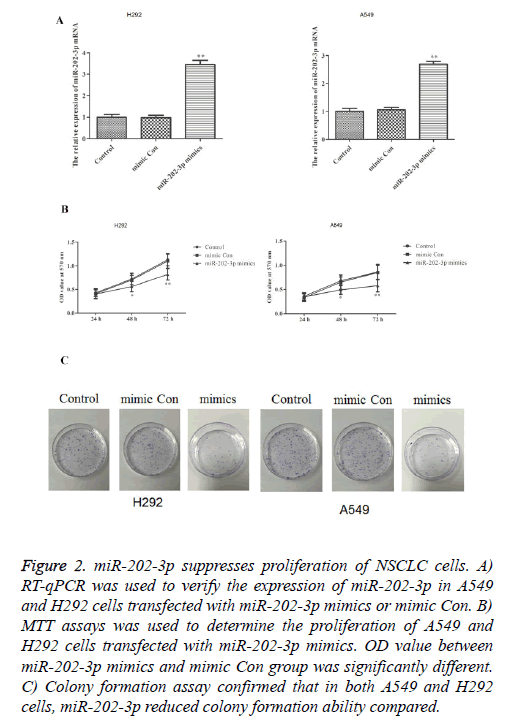 Figure 2: miR-202-3p suppresses proliferation of NSCLC cells. A) RT-qPCR was used to verify the expression of miR-202-3p in A549 and H292 cells transfected with miR-202-3p mimics or mimic Con. B) MTT assays was used to determine the proliferation of A549 and H292 cells transfected with miR-202-3p mimics. OD value between miR-202-3p mimics and mimic Con group was significantly different. C) Colony formation assay confirmed that in both A549 and H292 cells, miR-202-3p reduced colony formation ability compared. To further study the effects of miR-202-3p on the NSCLC cells apoptosis, we conducted the flow cytometry and found A549 cells transfected with miR-202-3p mimics exhibited markedly increased apoptosis rate compared with mimic Con group (Figure 3A). Furthermore, we performed western blotting to measure expression of Bcl-2 and caspase-3, which are classical apoptosis-related markers. As shown in Figure 3B, miR-202-3p transfection significantly inhibited Bcl-2 and increased caspase-3. These results demonstrated overexpression of miR-202-3p induces apoptosis and regulates apoptosis BCL-2 pathway in NSCLC cells. Figure 3: miR-202-3p induces cells apoptosis in NSCLC. 48 h after transfection with miR-202-3p mimics or mimic Con, NSCLC cells was collected for analysis of apoptosis. A) Flow cytometry was used to measure apoptosis in A549 cells. B) Western blotting was used to determine the protein expression of Bcl-2 and caspase-3 in A549 and H292 cells transfected with miR-202-3p mimics. To further understand the molecular mechanisms of above effects of miR-202-3p in NSCLC, following experiments were designed. The potential target genes of miR-202-3p was analyzed by TargetScan databases. MUC4 was showed to be one of the candidate targets. Bioinformatic analysis indicated 3’-UTR of MUC4 contains a predicted binding site for miR-202-3p (Figure 4A). Luciferase reporter assays was used to determine whether MUC4 is regulated by miR-202-3p in A549 cells. As shown in Figure 4B, the relative activity of luciferase in the reporter containing a wild-type MUC4 3’- UTR was markedly decreased upon miR-202-3p co-transfection. So far, we confirmed MUC4 is a direct target of miR-202-3p in NSCLC and miR-202-3p negatively regulates MUC4 by directly binding to its 3’-UTR sequence. Figure 4: MUC4 was a direct target of miR-202-3p. A) Predicted miR-202-3p target sequences in the 3’-UTR of MUC4. B) The miR-202-3p target sequence from MUC4 was cloned into the 3’-UTR of a luciferase reporter gene. Seed site mut was used to control for binding specificity. Luciferase activity was determined by Dual- Luciferase Reporter Assay System. In Figures 5A and 5B, expression of MUC4 protein was significantly downregulated in A549 and H292 cells after miR-202-2p transfection compared with the control groups. To draw a more accurate conclusion, the downstream signaling of MUC4, HER-2 and ERK were also evaluated. Results showed in both H292 and A549 cells, HER-2 and ERK activation were inhibited markedly by miR-202-3p transfection while the level of ERK substrate exhibited no obvious change. Thus, miR-202-3p overexpression in NSCLC significantly inhibited the expression of MUC4 and also affected its downstream signaling. Figure 5: MiR-202-3p overexpression suppressed MUC4 and its downstream signaling. 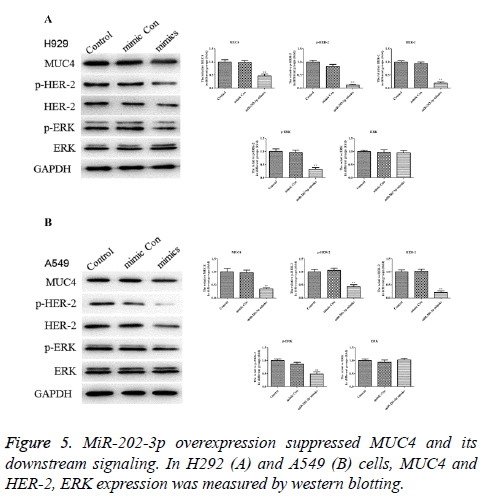 In H292 (A) and A549 (B) cells, MUC4 and HER-2, ERK expression was measured by western blotting. NSCLC is the most frequently diagnosed carcinoma and the leading cause of cancer-related death worldwide . Recent years, NSCLC shows an increasing incidence with very low survival rate and high mortality. Therefore, the underlying mechanisms in NSCLC, and new targeted therapies are in urgent need . In the present study, miR-202-3p was demonstrated to significantly decrease in NSCLC tissues and cell lines. Overexpression of miR-202-3p inhibited cell proliferation and promoted apoptosis in NSCLC accompanied with dropped expression of MUC4, which was initially high-expressed in NSCLC. We also found miR-202-3p transfection affected the downstream signaling of MUC4 significantly. Furthermore, MUC4 was confirmed by luciferase reporter assay to be a direct target of miR-202-3p. MiRNAs have been identified as the potential biomarkers for diagnosis and clinical prognosis in many cancers. Many miRNAs were demonstrated to be crucial in NSCLC [21-24]. MiR-202-3p has been reported as a tumor suppressor miRNA. For instance, downregulation of miR-202-3p modulates Mxd1 and Sin3A repressor complexes to induce apoptosis of pancreatic cancer cells . In our present study, the potential role of miR-202-3p in the progression of NSCLC was explored. Our findings revealed that miR-202-3p is remarkably downregulated in NSCLC tissues and A549, H292 cells (Figures 1A and 2B). Thus, it was indicated that miR-202-3p may be involved in NSCLC development. Encouraged by the findings above, further experiments were performed to investigate the precise influence of miR-202-3p in NSCLC. 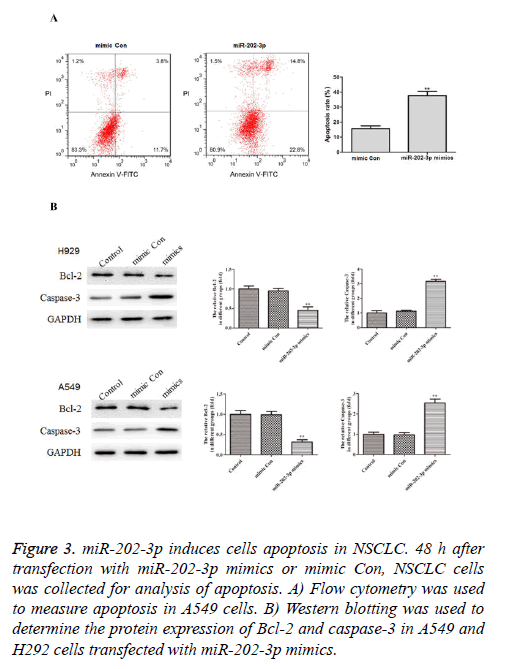 Cells were transfected with miR-202-3p and the data exhibited that cell proliferation was severely reduced (Figures 2B and 2C) while apoptosis rate was elevated significantly (Figure 3A), revealing that miR-202-3p may suppress cell viability but facilitate apoptosis in NSCLC. Furthermore, the mechanisms underlying miR-202-3p induced apoptosis were investigated. BCL-2 is a well-established apoptosis inhibitor . Various modulation elements of cell apoptosis exert their action through caspase enzyme system, among which, caspase3 is probably the one correlates best with apoptosis . Therefore, we assumed that miR-202-39 may affect apoptosis via BCL-2/caspase 3 pathway in NSCLC. 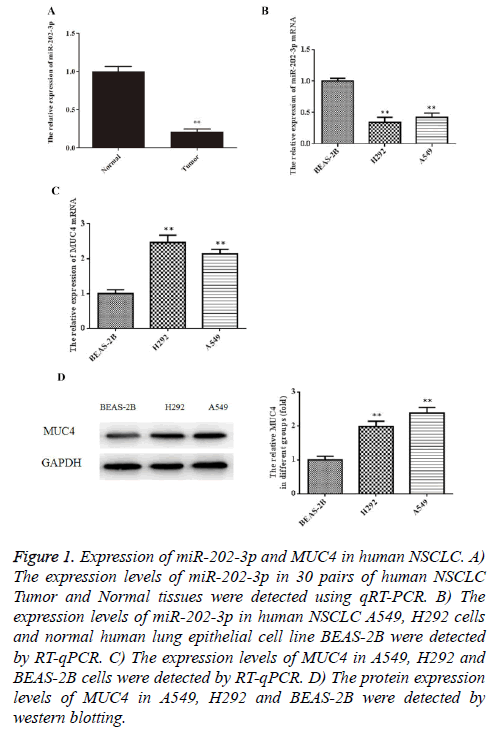 As expected, miR-202-3p overexpression induces apoptosis and regulates BCL-2 pathway in NSCLC cells. As shown in Figure 3B, in NSCLC cells, miR-202-3p significantly inhibited the expression of BCL-2 while facilitated caspase3, which confirmed our assumption. MUC4 has been reported to be a key regulator of various cancers. It is worth mentioning that MUC4 is widely demonstrated to affect cell proliferation and apoptosis in cancers, like pancreatic tumor , esophageal cancer . More importantly, MUC4 has been reported to abrogate proliferative signals in lung cancer and NSCLC cell migration and invasion properties are MUC4 dependent . In Figures 1C and 1D, data showed that MUC4 was significantly up-regulated in A549 and H292 cells. What’s more, our results demonstrated MUC4 is a downstream target of miR-202-3p and miR-202-3p may play a critical role in NSCLC by directly regulating MUC4 (Figure 4). To make sure that miR-202-3p did affect MUC4 expression in NSCLC, we continued to evaluate the downstream signaling of MUC4 in NSCLC cells with or without miR-202-3p transfection. Earlier, it has been demonstrated that MUC4 interacts with HER2 and positively enhances its stability to promote the expression . ERK, which belongs to the downstream mediators of HER2, was also tested . As shown in Figure 5, miR-202-3p repressed MUC4 and its downstream signaling in NSCLC cells. Therefore, we confirmed that in NSCLC miR-202-3p does target at MUC4 and affect its downstream signaling. To draw an exact conclusion, MUC4 overexpression or knockout and deeper research are needed in following study. To sum up, this study suggested that miR-202-3p inhibits cell proliferation in NSCLC at least in part via negatively regulating of MUC4. Therefore, miR-202-3p might work as an effective tumor suppressing miRNA in NSCLC. Our study provides a novel and promising therapeutic target for the treatment of NSCLC. Kato R, Hayashi H, Chiba Y, Tanaka K, Takeda M, Nakagawa K. Prognostic impact of minimal pericardial effusion in patients with advanced non-small-cell lung cancer. Clin Lung Cancer 2017. Calin GA, Croce CM. MicroRNA signatures in human cancers. Nat Rev Cancer 2006; 6: 857-866. Croce CM. Causes and consequences of microRNA dysregulation in cancer. Nat Rev Genet 2009; 10: 704-714. Cui YX, Bradbury R, Flamini V, Wu B, Jordan N, Jiang WG. MicroRNA-7 suppresses the homing and migration potential of human endothelial cells to highly metastatic human breast cancer cells. Br J Cancer 2017. Lizarbe MA, Calle-Espinosa J, Fernandez-Lizarbe E, Fernandez-Lizarbe S, Robles MA, Olmo N, Turnay J. Colorectal Cancer: From the Genetic Model to Posttranscriptional Regulation by Noncoding RNAs. Biomed Res Int 2017. Li W, Yang W, Liu Y, Chen S, Chin S, Qi X, Zhao Y, Liu H, Wang J, Mei X, Huang P, Xu D. MicroRNA-378 enhances inhibitory effect of curcumin on glioblastoma. Oncotarget 2017. Li X, Han J, Zhu H, Peng L, Chen Z. miR181b5p mediates TGFbeta1-induced epithelial-to-mesenchymal transition in non-small cell lung cancer stem-like cells derived from lung adenocarcinoma A549 cells. Int J Oncol 2017. Farhana L, Dawson MI, Fontana JA. Down regulation of miR-202 modulates Mxd1 and Sin3A repressor complexes to induce apoptosis of pancreatic cancer cells. Cancer Biol Ther 2015; 16: 115-124. Zhang Y, Zheng D, Xiong Y, Xue C, Chen G, Yan B, Ye Q. miR-202 suppresses cell proliferation in human hepatocellular carcinoma by downregulating LRP6 post-transcriptionally. FEBS Lett 2014; 588: 1913-1920. Florczuk M, Szpechcinski A, Chorostowska-Wynimko J. miRNAs as biomarkers and therapeutic targets in non-small cell lung cancer: Current perspectives. Target Oncol 2017; 12: 179-200. Majhi PD, Lakshmanan I, Ponnusamy MP, Jain M, Das S, Kaur S, Shimizu ST, West WW, Johansson SL, Smith LM. Pathobiological Implications of MUC4 in Non-Small-Cell Lung Cancer. J Thoracic Oncol 2013; 8: 398-407. Chaturvedi P, Singh AP, Chakraborty S, Chauhan SC, Bafna S, Meza JL, Singh PK, Hollingsworth MA, Mehta PP, Batra SK. MUC4 Mucin Interacts with and Stabilizes the HER2 Oncoprotein in Human Pancreatic Cancer Cells. Cancer Res 2008; 68: 2065-2070. Ogata S, Uehara H, Chen A, Itzkowitz SH. Mucin gene expression in colonic tissues and cell lines. Cancer Res 1992; 52: 5971-5978. Ramsauer VP, Carraway CC, Salas PJ, Carraway KL. Muc4 regulation of ErbB2/ErbB3 signaling. Cancer Res 2004; 64: 1113. Jeon JM, Lee HW, Park JY, Jung, Hwang I, Kwon SY, Choe MS, Kang YN, Kim SP, Lee SS. Expression of MUC1 and MUC4 and Its Prognostic Significance in Non-Small Cell Lung Carcinoma. Korean J Pathol 2010; 44: 397. Matull WR, Andreola F, Loh A, Adiguzel Z, Deheragoda M, Qureshi U, Batra SK, Swallow DM, Pereira SP. MUC4 and MUC5AC are highly specific tumour-associated mucins in biliary tract cancer. Br J Cancer 2008; 98: 1675-1681. Ramalingam SS, Owonikoko TK, Khuri FR. Lung cancer: New biological insights and recent therapeutic advances. CA Cancer J Clin 2011; 61: 91-112. Chen Y, Min L, Ren C, Xu X, Yang J, Sun X, Wang T, Wang F, Sun C, Zhang X. miRNA-148a serves as a prognostic factor and suppresses migration and invasion through Wnt1 in non-small cell lung cancer. PLoS One 2017; 12: e0171751. Shang Y, Zang A, Li J, Jia Y, Li X, Zhang L, Huo R, Yang J, Feng J, Ge K, Yang Y, Zhang Y, Jiang J. MicroRNA-383 is a tumor suppressor and potential prognostic biomarker in human non-small cell lung caner. Biomed Pharmacother 2016; 83: 1175-1181. Mody HR, Hung SW, Pathak RK, Griffin J, Cruz-Monserrate Z, Govindarajan R. miR-202 Diminishes TGFÎ² Receptors and Attenuates TGFÎ²1-Induced EMT in Pancreatic Cancer. Mol Cancer Res 2017; 15: 1029-1039. Zhang Y, Chen Z, Li MJ, Guo HY, Jing NC. Long non-coding RNA metastasis-associated lung adenocarcinoma transcript 1 regulates the expression of Gli2 by miR-202 to strengthen gastric cancer progression. Biomed Pharmacother 2017; 85: 264-271. Llambi F, Green DR. Apoptosis and Oncogenesis: Give and Take in the BCL-2 Family. Curr Opinion Genetics Dev 2011; 21: 12-20. Törmänen-Näpänkangas U, Soini Y, Kahlos K, Kinnula V, Pääkkö P. Expression of caspases-3, -6 and -8 and their relation to apoptosis in non-small cell lung carcinoma. Int J Cancer 2001; 93: 192-198. Chaturvedi P, Singh AP, Moniaux N, Senapati S, Chakraborty S, Meza JL, Batra SK. MUC4 mucin potentiates pancreatic tumor cell proliferation, survival, and invasive properties and interferes with its interaction to extracellular matrix proteins. Mol Cancer Res 2007; 5: 309-320. Bruyere E, Jonckheere N, Frenois F, Mariette C, Van Seuningen I. The MUC4 membrane-bound mucin regulates esophageal cancer cell proliferation and migration properties: Implication for S100A4 protein. Biochem Biophysical Res Commun 2011; 413: 325-329. Srivastava SK, Bhardwaj A, Singh S, Arora S, Wang B, Grizzle WE, Singh AP. MicroRNA-150 directly targets MUC4 and suppresses growth and malignant behavior of pancreatic cancer cells. Carcinogenesis 2011; 32: 1832-1839.